NORTH SMITHFIELD BLACKSTONE WOONSOCKET | VALLEY BREEZE | NOVEMBER 8-14, 2018 SPORTS & RECREATION 23 BREEZE PHOTOS BY ERIC BENEVIDES North Smithfield High junior NATHAN MASI, left, and Mount Saint Charles Academy sophomore CEEJAY LAQUERRE, right, finished in the top 50 in the boys' race at Sunday's RIIL Cross Country Championships at Ponaganset High's 3.1-mile course. Masi led the way by placing 44th out of 147 runners in a time of 17:27.48, and not far behind him was Laquerre, who took 46th place in 17:29.16. N.S. 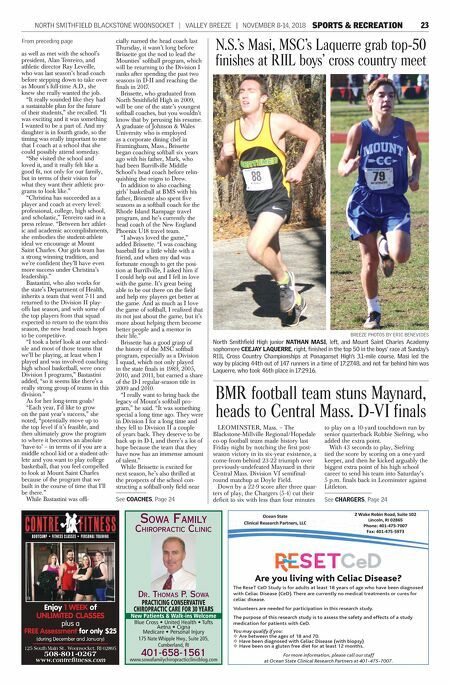 's Masi, MSC's Laquerre grab top-50 finishes at RIIL boys' cross country meet as well as met with the school's president, Alan Tenreiro, and athletic director Ray Leveille, who was last season's head coach before stepping down to take over as Mount's full-time A.D., she knew she really wanted the job. "It really sounded like they had a sustainable plan for the future of their students," she recalled. "It was exciting and it was something I wanted to be a part of. And my daughter is in fourth grade, so the timing was really important to me that I coach at a school that she could possibly attend someday. "She visited the school and loved it, and it really felt like a good fit, not only for our family, but in terms of their vision for what they want their athletic pro- grams to look like." "Christina has succeeded as a player and coach at every level: professional, college, high school, and scholastic," Tenreiro said in a press release. "Between her athlet- ic and academic accomplishments, she embodies the student-athlete ideal we encourage at Mount Saint Charles. Our girls team has a strong winning tradition, and we're confident they'll have even more success under Christina's leadership." Bastastini, who also works for the state's Department of Health, inherits a team that went 7-11 and returned to the Division II play- offs last season, and with some of the top players from that squad expected to return to the team this season, the new head coach hopes to be competitive. "I took a brief look at our sched- ule and most of those teams that we'll be playing, at least when I played and was involved coaching high school basketball, were once Division I programs," Bastastini added, "so it seems like there's a really strong group of teams in this division." As for her long-term goals? "Each year, I'd like to grow on the past year's success," she noted, "potentially move up to the top level if it's feasible, and then ultimately grow the program to where it becomes an absolute 'have-to' – in terms of if you are a middle school kid or a student-ath- lete and you want to play college basketball, that you feel compelled to look at Mount Saint Charles because of the program that we built in the course of time that I'll be there." 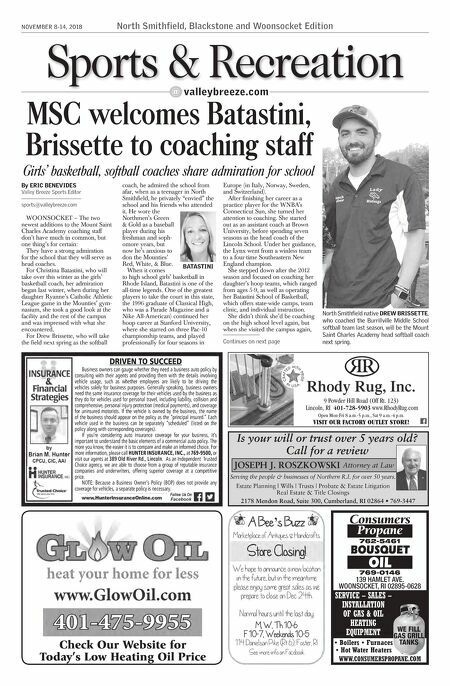 While Bastastini was offi- cially named the head coach last Thursday, it wasn't long before Brissette got the nod to lead the Mounties' softball program, which will be returning to the Division I ranks after spending the past two seasons in D-II and reaching the finals in 2017. Brissette, who graduated from North Smithfield High in 2009, will be one of the state's youngest softball coaches, but you wouldn't know that by perusing his resume. A graduate of Johnson & Wales University who is employed as a corporate dining chef in Framingham, Mass., Brissette began coaching softball six years ago with his father, Mark, who had been Burrillville Middle School's head coach before relin- quishing the reigns to Drew. In addition to also coaching girls' basketball at BMS with his father, Brissette also spent five seasons as a softball coach for the Rhode Island Rampage travel program, and he's currently the head coach of the New England Phoenix U18 travel team. "I always loved the game," added Brissette. "I was coaching baseball for a little while with a friend, and when my dad was fortunate enough to get the posi- tion at Burrillville, I asked him if I could help out and I fell in love with the game. It's great being able to be out there on the field and help my players get better at the game. And as much as I love the game of softball, I realized that its not just about the game, but it's more about helping them become better people and a mentor in their life." Brissette has a good grasp of the history of the MSC softball program, especially as a Division I squad, which not only played in the state finals in 1989, 2005, 2010, and 2011, but earned a share of the D-I regular-season title in 2009 and 2010. "I really want to bring back the legacy of Mount's softball pro- gram," he said. "It was something special a long time ago. They were in Division I for a long time and they fell to Division II a couple of years back. They deserve to be back up in D-I, and there's a lot of hope because the team that they have now has an immense amount of talent." While Brissette is excited for next season, he's also thrilled at the prospects of the school con- structing a softball-only field near From preceding page BMR football team stuns Maynard, heads to Central Mass. D-VI finals LEOMINSTER, Mass. – The Blackstone-Millville Regional/Hopedale co-op football team made history last Friday night by notching the first post- season victory in its six-year existence, a come-from-behind 23-22 triumph over previously-undefeated Maynard in their Central Mass. Division VI semifinal- round matchup at Doyle Field. Down by a 22-9 score after three quar- ters of play, the Chargers (5-4) cut their deficit to six with less than four minutes to play on a 10-yard touchdown run by senior quarterback Robbie Siefring, who added the extra point. With 43 seconds to play, Siefring tied the score by scoring on a one-yard keeper, and then he kicked arguably the biggest extra point of his high school career to send his team into Saturday's 5 p.m. finals back in Leominster against Littleton. See CHARGERS, Page 24 See COACHES, Page 24 Sowa Family ChiropraCtiC CliniC Dr. thomaS p. Sowa PRACTICING CONSERVATIVE CHIROPRACTIC CARE FOR 30 YEARS Blue Cross • United Health • Tufts Aetna • Cigna Medicare • Personal Injury 175 Nate Whipple Hwy., Suite 205, Cumberland, RI 401-658-1561 www.sowafamilychiropracticclinicblog.com New Patients & Walk-ins Welcome 125 South Main St., Woonsocket, RI 02895 508-801-0267 www.contrefitness.com Enjoy 1 WEEK of UNLIMITED CLASSES plus a FREE Assessment for only $25 (during December and January) Are you living with Celiac Disease? The ReseT CeD Study is for adults at least 18 years of age who have been diagnosed with Celiac Disease (CeD). There are currently no medical treatments or cures for celiac disease. Volunteers are needed for participation in this research study. The purpose of this research study is to assess the safety and effects of a study medication for patients with CeD. You may qualify if you: G Are between the ages of 18 and 70. G Have been diagnosed with Celiac Disease (with biopsy) G Have been on a gluten free diet for at least 12 months. For more information, please call our staff at Ocean State Clinical Research Partners at 401-475-7007.